1. Access to a great hand specialist practice. I highly recommend Lamont Cardon (MD) and Broheen Elias (PA) at Alta Bates. Competent and accommodating, they respected my professional needs and supported my decision to continue playing flute during the healing process. 2. A solid cast to protect the injured ligament, one with extra wiggle room for four fingers. 3. Prosthetic materials/supplies: plastic coat hanger, ace bandage, scotch tape roll, OTC wrist support brace, duct or teflon tape, hot glue, patience, a sense of humor. 4. (and this is critical…) Indomitability. 5. Optional: bottle opener fixture and epoxy to adhere. I decided this was important because what could be cooler than opening someone’s beer with your prosthetic flute thumb? 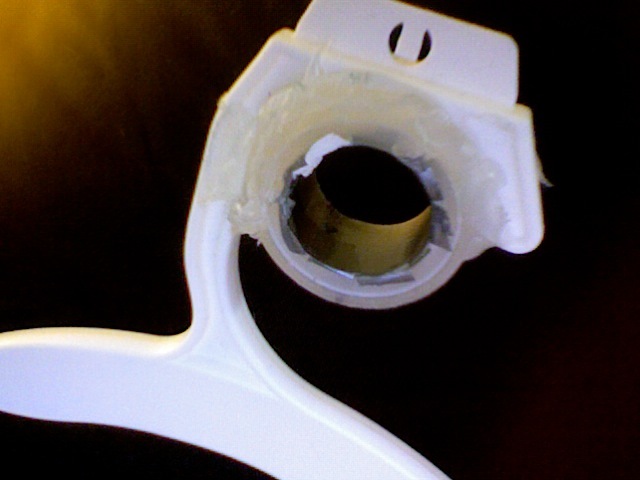 Remove layers of scotch tape until the outer diameter of the tape roll fits into the inner curve of your coat hanger hook. 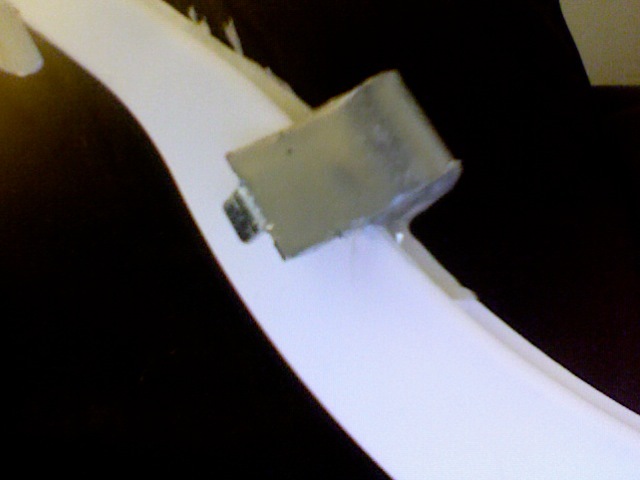 Glue the scotch tape roll into the curve of the coat hanger. 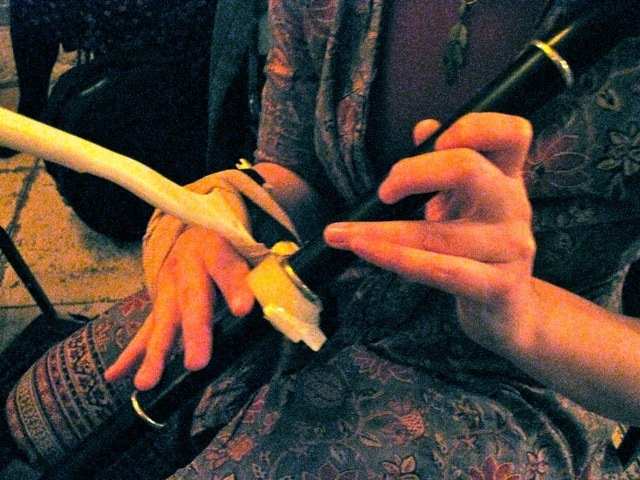 Use duct or teflon tape adjust the inner diameter of the scotch tape roll — it should fit snugly onto the bore of your flute, right at the point of desired support. Optionally, attach bottle opener to the distal coat hanger arm using epoxy. Here’s what it should look like so far. Now work out how you will put the coat hanger on in a way that is comfortable and stable. 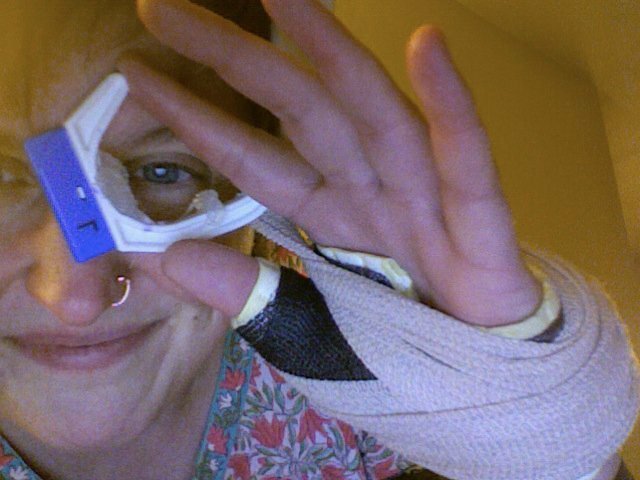 I used a simple velcro wrist brace to support the distal end of the hanger, then an ace bandage to hold the hanger in place against the cast and keep it adjacent to my forefinger. Now your thumb is on, and you are ready to hit the seisiún. Attach flute. I play a keyless split-body (four piece) Olwell and designed the scotch tape roll to fit at the proximal end of the third section, right up against the silver tenon ring. Wherever you choose to attach the hanger, the instrument should be held firmly in place, just as if you were supporting it with your previously-functional thumb. A scrappy plastic thumb that can open beer bottles is exciting, I know, as is playing again for the first time since your big injury. But be mindful of the medical situation and your (dis)abilities. Muscle fatigue was a problem for me, as were hand tremors and spasms. Be gentle with yourself and play only to tolerance. Long term healing is critical, so construct your project with safety in mind — run the basic design of your prosthetic by a hand specialist. That’s one of the reasons you went to the trouble of hiring a hand specialist, right? Utilize his/her expertise. For longer performances, detach the flute from the hanger to take a break and socialize. But I suggest leaving the prosthetic attached for the whole evening, partly for convenience, but also because it is a great conversation starter. Over time, make flute body alignment and ace bandage wrap changes as necessary. As your fingers grow stronger and the swelling goes down, you may need to make minor adjustments to get the instrument in the right place for your healing fingers. Wednesday, February 2, 2011. 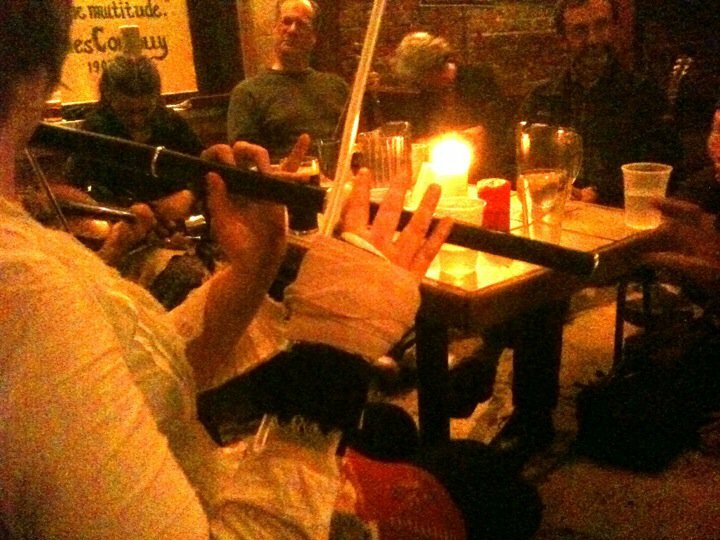 Tags: altered flutes, body reclamation, finding answers, flute, gamekeeper's thumb, healing, music, odd, playing music with injuries, prosthetic thumb, prosthetics, sculpture, traditional music, UCL sprain, UCL tear. flute, music, sculpture, traditional music. Leave a comment.